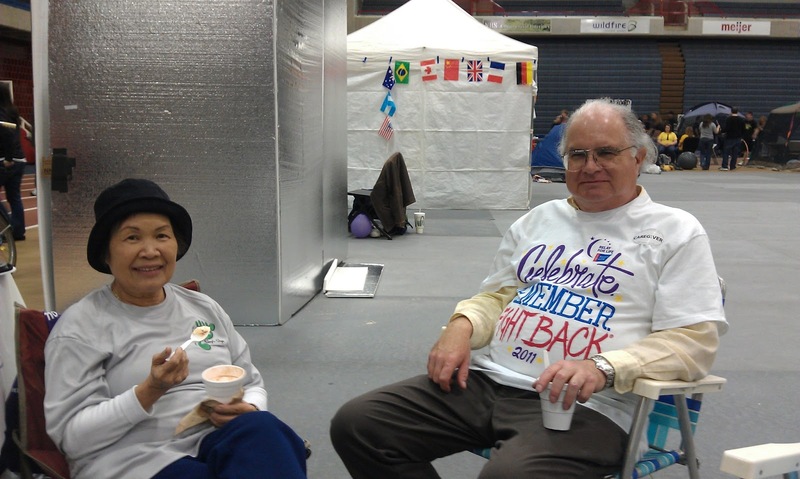 Thanks for your support at Relay for Life! First, I would like to thank everyone for their support and donations leading up to SVSU's Relay for Life on April 8th and 9th. At last count, we raised $3,285 dollars. That's an incredible amount of money and part of a record amount raised at a SVSU Relay for Life event. Thanks to my wife and son, my mother and father, my mother-in-law Denise, the Management Staff of Genetron Engineering, my cousins Eddie, Sandi, Herman, and Simon, my brother Dave, all of my uncles and aunts, my friends Chris, Karen, Beth, Mike, Erin, Brian and Heather, Dave and Terry. You generosity came so quickly and in such volume that I am likely missing some names. I deeply appreciate your outpouring of support. The event itself was wonderful and I'd like to thank Jon Ward and the rest of the dedicated SVSU students that put the Relay together. At last count the event had raised $51,000, had almost 700 participants, and 53 teams. That is a major undertaking. It was really unlike any other event that I have participated in. It was more of an all night party than any sort of race. After the opening ceremony, my mom and dad, Holli, Elliott, Denise, and I walked a couple laps together as Team Single Step. Then, as the crowd loosened up and groups headed back to their team sites I started jogging. It was a little crowded so I had to do a little dodging and weaving, but I wasn't in a hurry so that wasn't a problem. I felt a little funny since I was the only one running, but as Holli reminded me early on, that's what I was there to do. Minutes turned into hours and the laps faded by. I didn't bother counting laps and just enjoyed the spectacle of college students raising money for a good cause. There were pie eating contests, tug of war contests, a cross-dressing date auction, and more entertainment than I typically encounter on a run. Elliott discovered a giant, inflatable obstacle course that was, no doubt, the highlight of his evening. There were even some very memorable laps jogging around with my mother. Elliott, Holli, and Denise headed home to get some sleep and Team Single Step dwindled to my parents and I. At one point, my dad took over walking and I relaxed at our campsite and chatted with my mom. It really was both entertaining and a great time to just relax and spend time with love ones. As time passed, I began to overhear comments like "Is that guy still running?" Team Single Step was down to me by 11:00 or so. I was still feeling pretty good since I'd been keeping a slow pace and taking periodic breaks to chat with friends and family. The crowd at the event was going strong and it was around that time that many college students, who exist on a much different clock than the rest of society, began to show up. The energy in the gym made running easy. At one point one of my students sent one of his team mates running after me to sell me a cupcake, which provided much needed sustenance. John and Pat, my son's former swimming teacher, joined me in jogging for several miles as we swapped running stories. At one point several students formed a human tunnel for me to run through. There were also a couple very moving ceremonies during the night that broke up my running. Around 4:00 AM several teams had packed up and the energy in the room was starting to diminish. Similarly, my energy was starting to diminish. The long run was starting to wear on me. I sat down in a lawn chair and even dosed off for about 10 minutes. I took another lap on sore and stiffening legs, but didn't really have it in me so I put on my sweats and decided to call it a night. I'd been in motion, on and off, since around 6:15 PM the night before. Pat, who had been running with me earlier, stopped over to check on me and I told him that I was calling it quits. After chatting for a minute, Pat moved on. Much to my surprise he came back a couple minutes later to tell me that he had decided to finish the run for me. At that point there was about an hour and a half left in the event. Team Single Step lived on. Despite having not run for 3 months, the newest member of Team Single Step finished the race in style. Three days until the 2011 SVSU Relay for Life and at $2,100 in donations. Our team has slipped from 3rd place in terms of fundraising and we won't reach the goal I set when we started fundraising. That's okay. I'm fairly certain that our donations per capita are the best of any team. ;) Still, I'm spending the evening taking one last shot at picking up more donations. As one of the event organizers pointed out to me, EVERYONE is impacted by cancer. EVERYONE knows someone who has been impacted by cancer. In some ways it would seem that this makes asking for donations easier. For me, it just makes it more intimidating. The issue of cancer feels so ubiquitous that I feel we are inundated with messages to donate. Perhaps we even become numb to it at times. I'm sympathetic to that. But I'm also grateful that my mom's surgery and chemotherapy were, by all indications, successful. I'm grateful that Mike's surgery a couple years ago was successful. I'm happy that my good friend's mother survived her breast cancer. I'm glad that my grandmother's skin cancer many years ago was successfully treated. I'm saddened that my other grandmother's cancer was not. I'm sure that I am missing other friends and family. I wish it had been harder to generate this list. So, I urge you to go to www.teamsinglestep.com and click on the "I'm a proud supporter of Relay for Life" button on the right. Please donate. I don't really care how much. Heck, donate to someone else's team or at another Relay for Life event. Don't donate because it will cure cancer--it won't hurt, but unfortunately our individual actions rarely carry such power. Donate for the people you know who are impacted by cancer. Even if your donation does not cure cancer, it can demonstrate your gratitude for and appreciation of these people.